In Paris, why yes it certainly does. A big blue snake providing tourists with a perfectly glideable passage across the city, given that a great deal of the best sights hug the banks of it. The Seine is also a godsend for the more permanent beings of Paris too, offering kilometres of meandering cobbles along which picnics are encouraged, if not practically compulsory. Many choose to settle next to the flowing water when a sunny evening beckons armed with good conversation, cheese and wine (is there anything else in life you could possibly need? ), whilst others prefer to dream of beach volleyball, sheened and bronzed torsos, and string bikinis on the urban sand at Paris Plages. But I’m the kind of girl who likes to go against the grain, and as much as I’d be perfectly content with either option, I rather keep it more real. Well, reel at least. 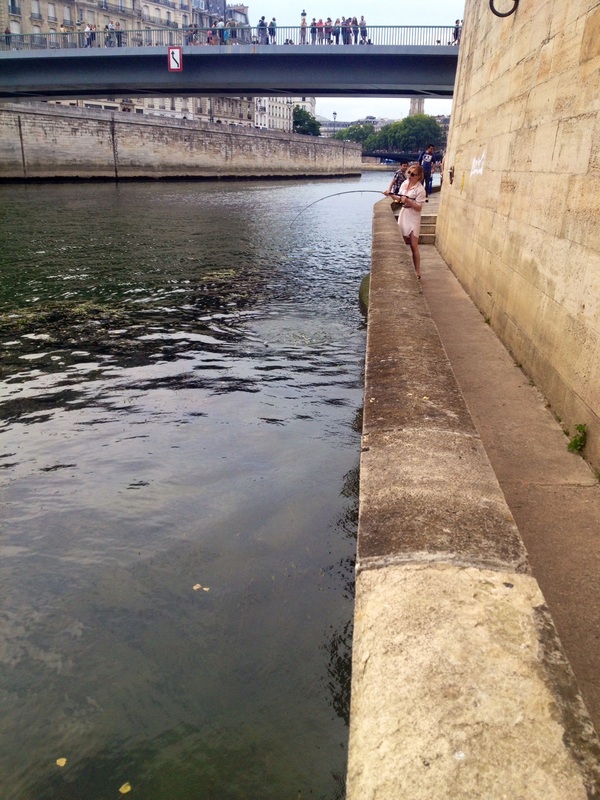 One of the last things you expect to see whilst strolling along the river bank are handfuls of folk dipping long sticks into the water, hoping for an animal from the deep to take hold, but holy baited hooks Batman, in Paris the fishing bug has well and truly bitten. It found me when I was merely a young sardine, carted along with my dear granddad to the beaches and piers on the south coast of England where I caught my first tiddler aged three (I suspect the grown-ups helped me out a bit with that…). Never did the prospect of river-tickling enter my thoughts when thinking of activity-filled days in the French capital. Then I entered the world of French employment and met Ed, a fellow Brit and rod-dipping maniac (enthusiast seems too disengaged a word somehow) who lured me back to the shore, and took me for my first riverside expedition. Lucky for me, he’s a well-kitted out sort of chap, so I was able to ride off the braces of his yellow fishing dungarees and avoid the expense of procuring my own equipment, and more happily, putting the worms on the end of the hooks (though it turns out a certain type of dog food is in fact his secret weapon). Two fins up. Our chosen spot is as central as you could possibly get, slap-bang between the two islands Cite and Saint Louis, where there’s a bridge supplying both ready-made rain coverage and punter’s gallery for the onlookers to marvel at the beasts we dredge from the bottom of the murky flow. I’d like to say the applause doesn’t penetrate professionals like us, but sometimes, just sometimes, it’s the glory we’re all after. I’m not going to lie to you. It’s as much about the beer and the socializing than anything else, though the fishing element definitely adds a sense of purpose to hanging around aimlessly on the banks of the Seine (I resemble a Jack Russell puppy in my constant inability to sit still and the need to be constantly doing something, so it suits me fine). With his wonderfully patient and accepting girlfriend Beth, Ed can spend hours waiting for the rod to twitch all but a few millimetres, and for him it’s a rain-or-shine deal (not so for me and Beth who creep indoors when the heavens open). But the wait is worth it. 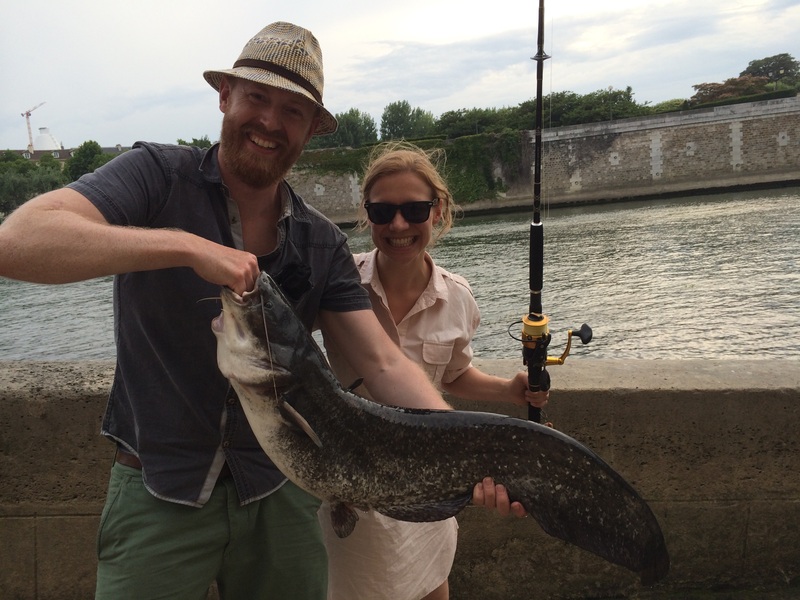 In the first picture you’ll see my first catch, a 30-odd-kilo catfish of nearly mythical proportions – wot I caught myself whilst wearing a dress (Ed’s fishing buddy Mathieu swears I’m the only girl in Paris ever to have done so). In the second, you’ll see last weekend’s spoils, again reeled in whilst wearing a dress (you’re welcome). 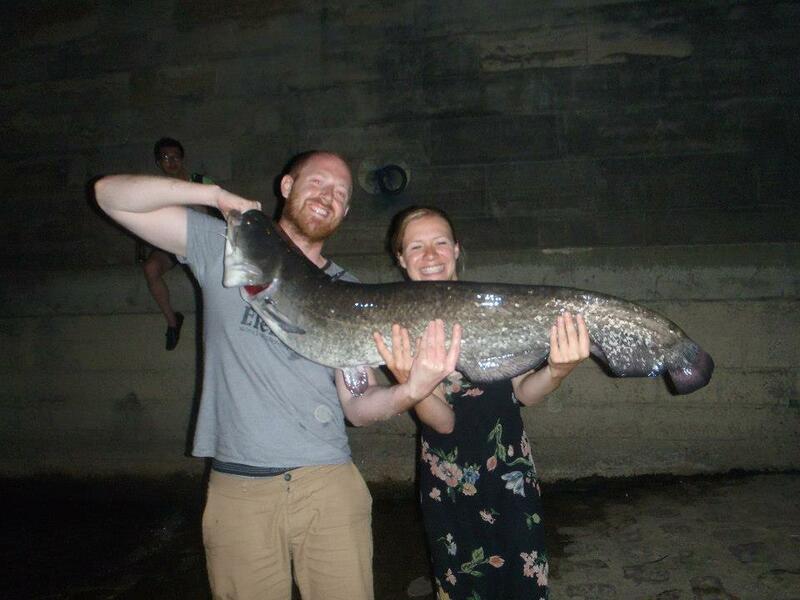 These bottom-feeders aren’t for eating though; if you’re surprised there are fish in the Seine at all due to the less-than-clean water quality, you’ll understand why we get our glory snap and throw them back. And hopefully you’ll understand more about the activity than some of the passers-by who have quizzed us during past expeditions. “How on earth did you get the idea?” one Parisienne asked, clearly flummoxed by the whole exercise. Not wanting to insult her by explaining the centuries-old equation of rivers = fish, I claimed the whole thing as my own. Kim – Princess of scales. To get involved you need a rod and related equipment, obviously (which Decathlon et al do decent lines in, amongst others), but more important, a fishing permit (you can get the just for the day), available from www.cartedepeche.fr. Though if you encroach on our patch, it might be you being fed to the fishes. Know what I’m sayin’?